Sport Fisherman Shares His Close Call Boat Accident. Courtesy of National Safe Boating Council. Inexperience and negligence are contributing factors to propeller and vessel strikes on divers and swimmers. Adherence to Federal and state boating laws here in the U.S. certainly helps but regulations vary by location and do not apply elsewhere in world. The fact is, regardless of your location, the key to preventing injuries and death by propeller and vessel strikes is simple: boaters, divers, and swimmers must be proactively aware of one another at all times. Avoid alcohol consumption while on board. This applies to your passengers, as well. Use a kill-switch with lanyard (a.k.a. kill cord) at all times to automatically shut off the engine in the event something happens to the driver. Avoid swimming zones and stay a safe distance away from dive flags. Maintain a distance of at least 300 feet from flags and buoys in open water and at least 100 feet in inlets or navigation channels. Ensure the engine is off and the propeller is still before allowing boarding or disembarking. This includes the swim platform; do not allow anyone near it while the engine is in gear. Make it clear to your passengers that they must stay clear of the propeller at all times, even when it is not moving. An immobile propeller can still cause injury. Before starting the boat, make sure no one is swimming or diving near or under the boat. Do not allow people to sit on the transom, bow, or gunwales. All it takes is one good bounce or unexpected swerve to send your passengers overboard. Constantly look for people in the water. Do not assume divers and swimmers are always visible. Glare from the sun, waves, passenger activities, weather conditions and other factors can make visibility challenging. "Don't Wreck Your Summer". Courtesy of NASBLA Safe Boating. Bonus Tip: Be prepared. Depending on your location, a 911 call via cell phone may not be an option so knowing who to contact for emergency medical evacuation and having multiple forms of reliable communication with which to reach them, is critical. Also keep in mind that if it took you several hours (or days) to get to your current location, it could take emergency personnel the same amount of time to reach you. 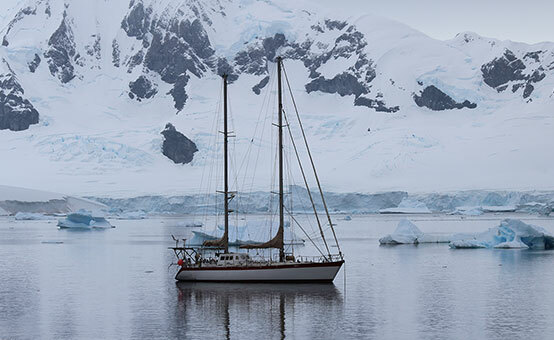 So make sure you have well-equipped first aid kits and oxygen units aboard and that you know how to use them. Be prepared with a DAN Boater Family Membership. Worldwide coverage only US$100. 24/7 Hotline, Medical Info Line, Emergency Medical Evacuation and Repatriation & more. Remain clear of the propeller at all times. Even a disengaged propeller can cause injuries. Use the diver down and alpha flags appropriately. Stay within 300 feet of the diver down flag or buoy in open water and 100 feet when diving in rivers, inlets or navigation channels. Aim to surface within 150 feet of the dive flag. Establish clear communication with the boat operator and others on board so everyone knows what you plan to do. Pay attention to the boat procedures and dive briefing. Wait until the boat operator indicates the engine is off, and it is safe to enter the water; follow the established safety procedures for entering and exiting the boat. Never assume you are visible in the water. Use flags, buoys and other devices to make yourself more noticeable. Maintain vigilance. Keep an eye out for boat traffic at all times. Divers: scan for boat traffic during your safety stops. Bonus Tip: Have an emergency action plan in place. Prior to arriving at a dive site or anchoring point, make a plan for how you will respond to and evacuate someone who was injured by a boat or propeller. 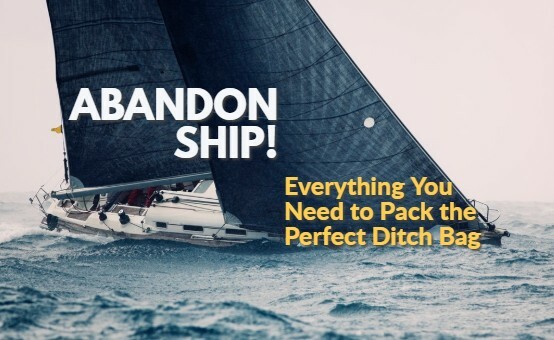 If you’re traveling on someone else’s boat, find out if the owner/operator already has a plan in place and, if so, get the details. When on the water, be sure to use these universally recognized flags and buoys appropriately. Flags should be stiff, unfurled and in recognizable condition. This flag explicitly signals that divers are in the water and should always be flown from a boat or buoy when divers are in the water. When flown from a boat, the diver down flag should be at least 20 inches by 24 inches in size and flown above the boat’s highest point. 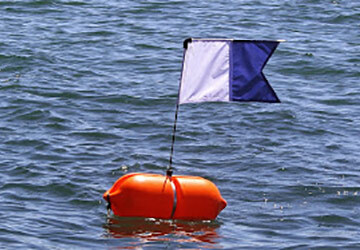 When displayed from a buoy, the flag should be at least 12 inches by 12 inches in size. Internationally recognized, this flag is flown when the mobility of a boat is restricted, indicating that other vessels should yield the right of way. 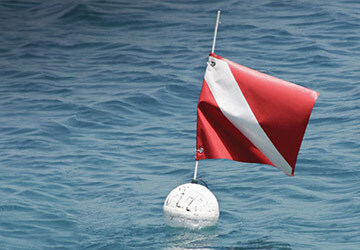 The alpha flag may be flown along with the diver down flag when divers are in the water. 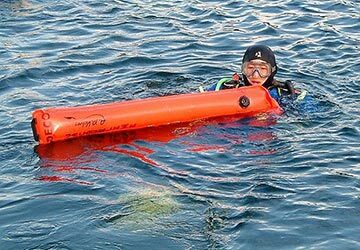 When deployed during ascent, a surface marker buoy helps make a diver’s presence more visible. In addition to the buoy, divers should also use a whistle or other audible signal and a dive light or signaling mirror to notify boaters of their location in the water.